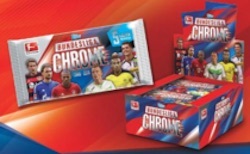 Just like the 2014-15 season, German soccer fans can collect their favorite players in chromium technology courtesy of 2015-16 Topps Bundesliga Chrome. The shiny release promises two hits per box. The full base set includes 242 of the top names in DFL. Unlike standard Topps Chrome releases found stateside, the set does not include Refractor parallels. In addition to the base cards, collectors can find two main hit options. 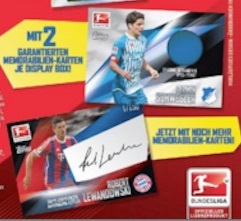 A tentative 36 players are found among the Signature Cards, including Thomas Muller, while another 55 populate the Memorabilia Cards checklist. These relics include shirts, gloves, boots and shorts. There is also a Supercup Relic that features a piece of of the ball used in the 2015 matchup between Bayern Munich and Wolfsburg. While previous Bundesliga Chrome products have only included one autograph or relic per box, the 2015-16 edition doubles the output to two hits. Bundesliga does have considerable mainstream recognition and global stars but this product has a limited availability for those in North America and it will be issued in Europe and Asia.